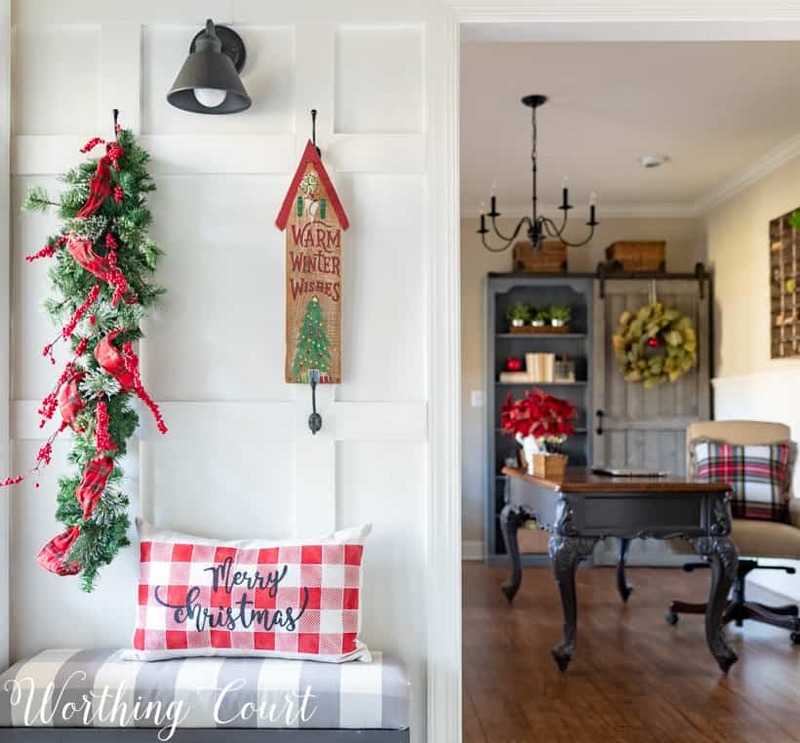 The foyer here at Worthing Court is merry and bright and is a preview of all of the Christmas colors that you’ll see throughout my home this year. It’s a place that’s meant to welcome our guests during this most festive time of year! …and the entrance into our home office that leads into the dining room. 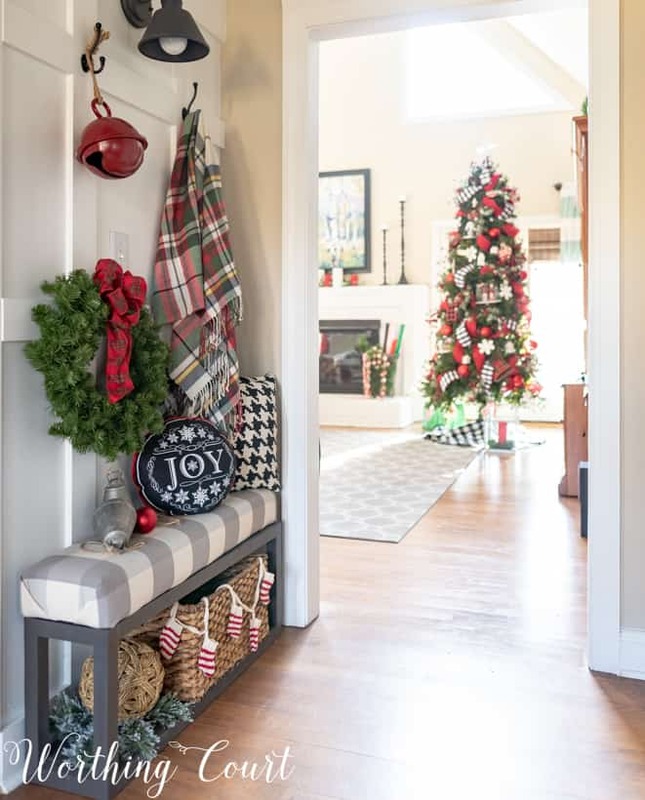 I think the front porch and foyer set the mood for the rest of the house, so it’s important to me that both spaces be filled with welcoming warmth and charm! 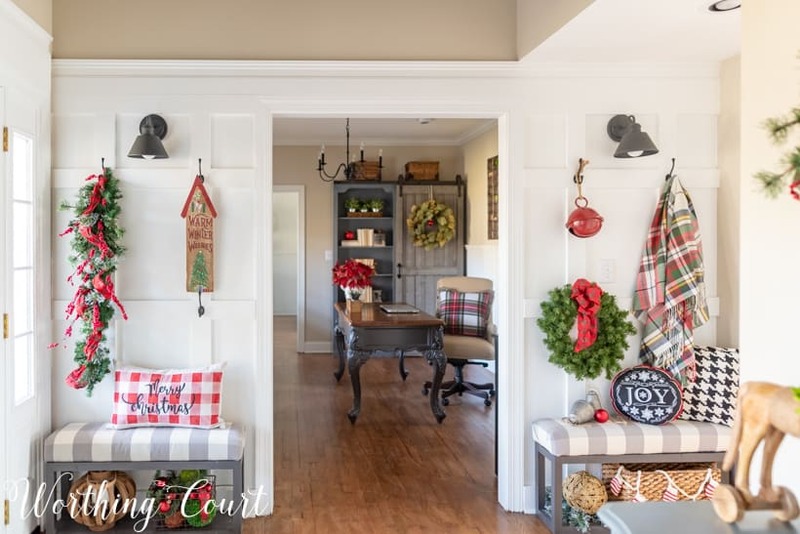 It’s also the place that ties all of the other rooms together so that the decorations flow from one room to the next. 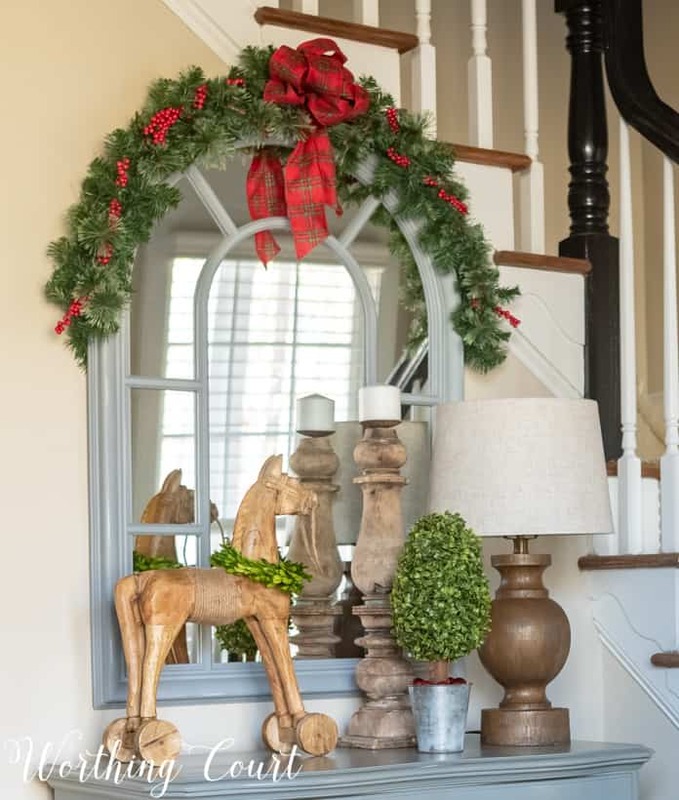 I gave my wooden horse a boxwood collar and relocated him from the office to the foyer chest and added one of my favorite candlesticks and a boxwood topiary with tiny red ornaments around the base. 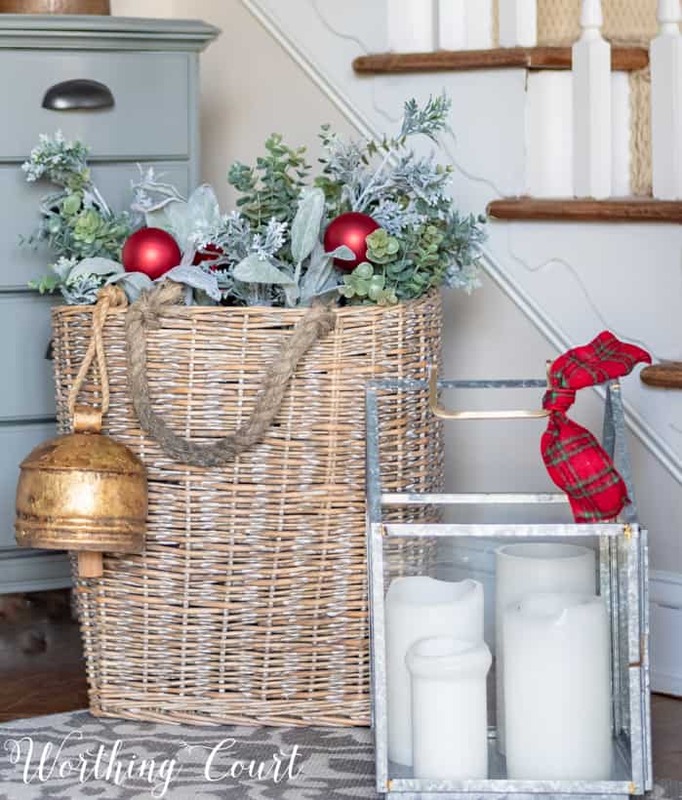 A favorite basket sits in front of the chest and is filled with artificial lambs ear, eucalyptus and other sagey green plants with a few frosty red ornaments tucked in between the branches. I’ve fallen in love with the look of sagey green mixed with red this year! 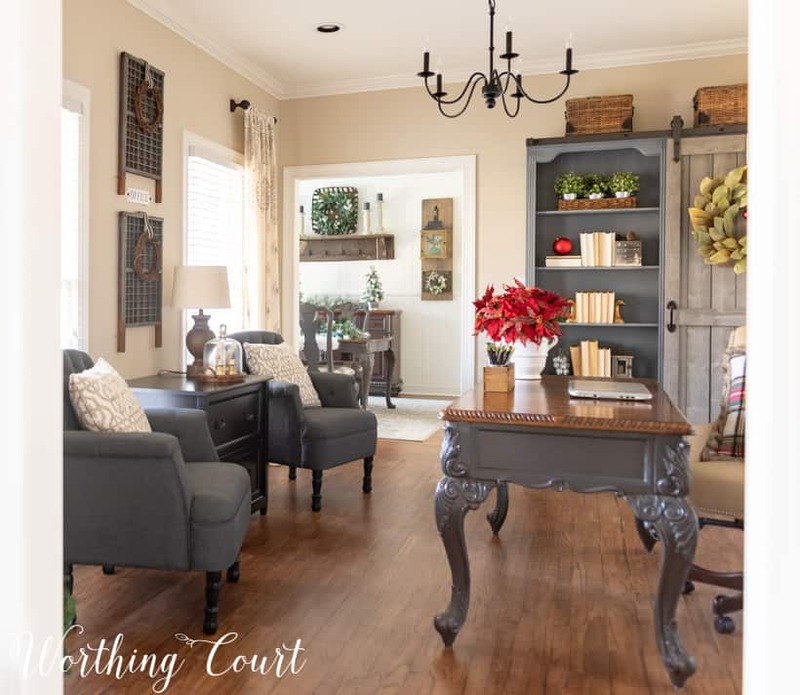 Adding the board and batten accent wall to my foyer was one of the best changes that I made in here when I gave it its makeover! The hooks hold lots of fun and sentimental things. I went shopping in my stash to see what I could put together on this wall and love how it all came together! 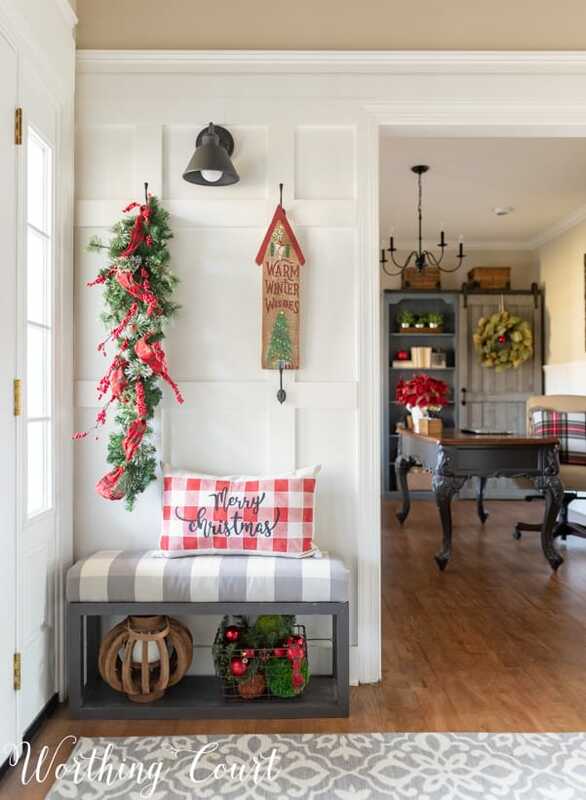 It’s a real feature in my foyer and is a fun space to decorate every season. The “Warm Winter Wishes” sign was hung on my mom’s front door every single year and that was always a signal to me that the Christmas season had arrived at her house. It eventually became the only Christmas decoration that she displayed as she got older, but her sweet Christmas spirit never left her! Our DIY benches are fun to dress up too. As you can probably tell, I love to mix patterns, but I always make sure that the patterns “play” well with one another. 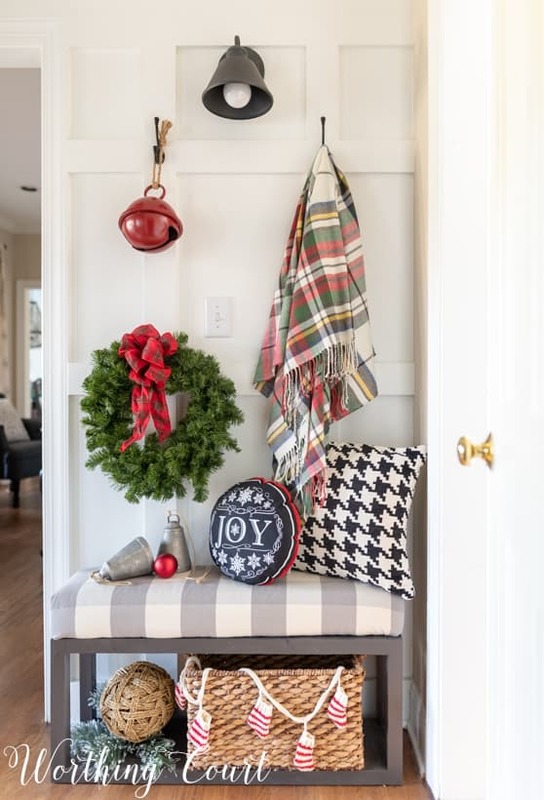 😀 Gray and white buffalo check mixed with black and white houndstooth, a traditional plaid throw with a little bit of tartan plaid ribbon thrown in! Don’t forget about adding small details in spaces that are easily overlooked. Those little touches can make all the difference! My annual Christmas party is just a little over a week away, and I’m so excited to welcome everyone into our merry and bright foyer! Thank you for stopping by today. I hope you found some inspiration for your own home! Omg how pretty is this? Love the plaid. I’m in to plaid this year. 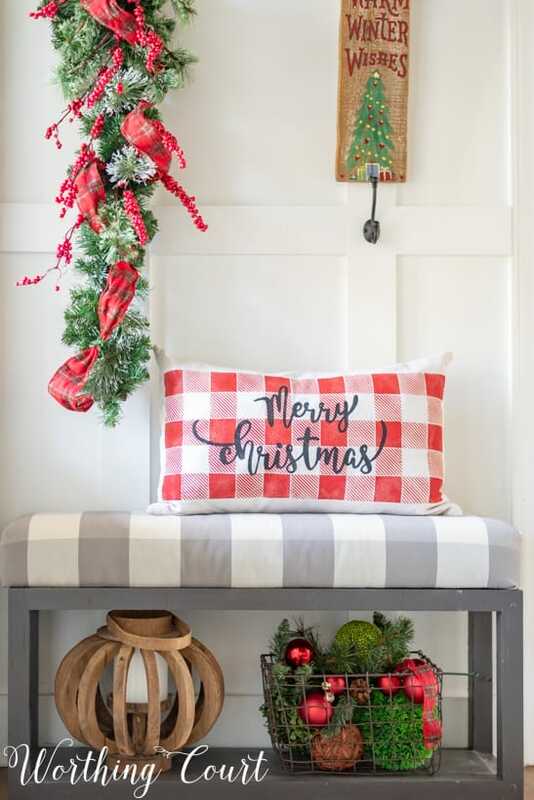 And that houndstooth pillow…roll tide! Lol. Your entry is very welcoming. I lo v e it! 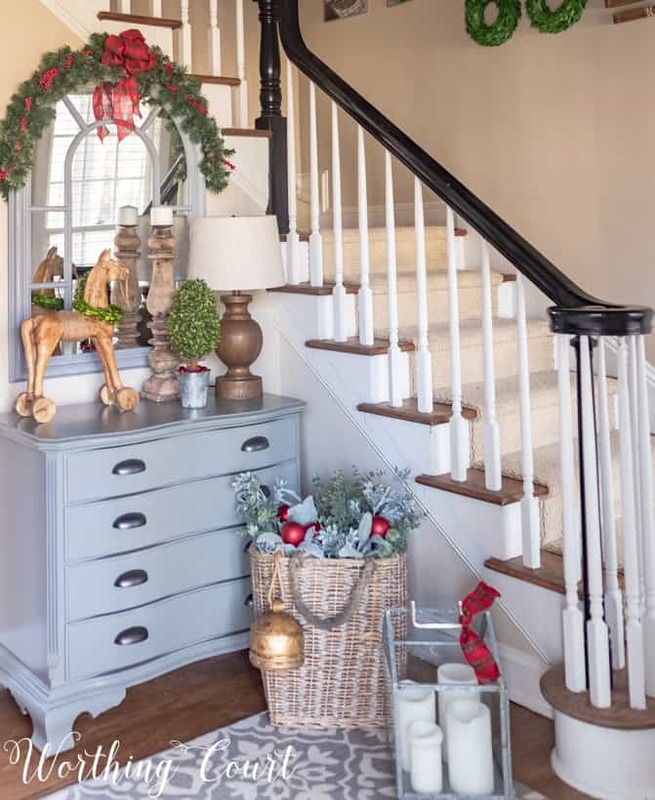 Your foyer looks so welcoming and merry! Your home is so very lovely and festive! I just love your blog – very inspiring. I just have to ask – would you share where you found the round JOY pillow – it is stunning. Happy Holidays! Hi Sonja. I found the JOY pillow at At Home a couple of years ago. Merry Christmas!